We discovered the beautiful art of John August Swanson while we were students of the International Harp Therapy Program (IHTP). On a side trip to Old Town, we found Mr. Swanson’s work in a shop and were immediately drawn to his images of God’s light and love moving in and through people. 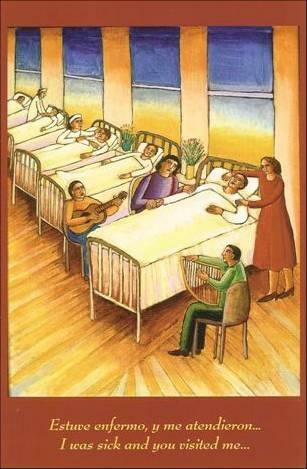 Here we see one of his paintings, Time To Heal, in which two musicians are playing at a patient’s bedside. The harp is a physician of love that ministers to all people, healing body, mind, soul and spirit. The harp has a long history of healing, deeply rooted in the human psyche that connects people to God. Some people experience healing by simply looking at the instrument. The harp carries spiritual power, and the gift it brings to patients and families through the beauty of its sound is one of hope.